(LOCATION: Cocoa Beach FL) This Sea Ray 500 Sundancer is designed to be the ultimate day cruiser with lots of room and power while providing luxurious accommodations for overnight and weekend getaways. A 2007 renovation brought this Sundancer into the 21st century with mechanical, electronic, and interior upgrades. On deck we have a carpeted cockpit with radar arch and Sunbrella bimini top with full enclosure. The helm features an adjustable helm seat with extra-wide companion seating. The spacious cockpit features a huge wraparound lounge with removable table and a filler cushion that converts sun lounge. An L-shaped transom lounges is included for those seeking a wind-in-their-face cruise. Theres a port side wet bar with ice maker. A transom door gives access to the integrated swim platform, transom locker, and freshwater shower. The foredeck features stainless steel bow rail, searchlight, bow pulpit with roller, anchor with chain, and windlass. The spacious salon has a starboard galley with upper and lower cherry cabinets, molded fiberglass countertop with integrated sink, a electric cook top, built-in microwave oven, Nutone food center, a stand-up refrigerator/freezer, and a breakfast bar with two stool. Aft of the galley is a large curved curved settee and adjustable cherry table. Port side is an entertainment with TV, DVD, Kardon sound system, and ice maker. Upgraded bamboo flooring accentuates the upscale interior. Three zone reverse cycle HVAC with digital controls maintains cabin comfort, a Westerbeke genset provides offshore electrical power, and a central vacuum system makes housekeeping easy. There are two private staterooms. The forward master stateroom has queen berth, under-berth storage, dressing table with ottoman, and cedar-lined hanging lockers. The en suite head mirrored vanity, Vacuflush head, and shower stall. The guest stateroom has upper and lower full sized berths, under-berth storage, hanging locker, and private head access. The guest/day head compartment has mirrored vanity, Vacuflush head, and shower stall. This big Sundancer is powered by twin 480-hp Detroit Diesel engines. She is well equipped, carefully maintained, and ready to cruise. Complete survey available for the potential buyer. 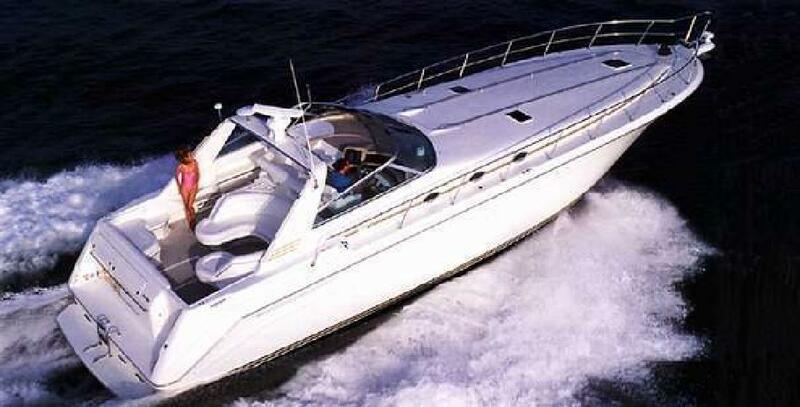 Call now for more information and to schedule a showing of this very desirable 50' Sea Ray. Draft: 4 ft. 0 in. Beam: 15 ft. 0 in.